Command line tool is a good thing, but user friendly graphical interface – even more. This story is about MySQL design environment, or GUI. Exactly most of programmers need – easy edit, function to save query, connection management and data / structure synchronization. And, of course – backups. I would rather say this is most successful software for MySQL I ever found. I have dug huge amount of software intended to facilitate work with databases and I ended at this - Navicat. List of functionalities is large enough. More over Navicat exists as well for MySQL, as for Postgresql, as for Oracle. Software should be installed separately (and you have to buy it separately), but interface is similar for all of them. It works in Windows, Linux and even Mac. I have tested Navicat on Windows. On linux using wine – works good (and what is the most amazing – stable). I use Navicat for MySQL and Postgresql for around 2 years. It is possible to create table (and its structure) in a nicely designed window. Also define / edit index, foreign keys and triggers. Trigger editing windows might be better. It is possible to save query (locally of course). Here we talk not about views (they can be made and saved as well), but regular sql query, mostly used in php or other code. Rather convenient procedure / function editing window. Backup is stored in some unknow datatype, but can restore selected objects, procedures, views. If it is needed, you may dump sql. It is possible to monitor process list, active connection, view what is executing and terminate them. Editing trigger, in case of error on saving – very probable it will be lost and might be needed to write it once again. Technically, it look that old trigger is dropped, but new cannot be created because of mysql error. 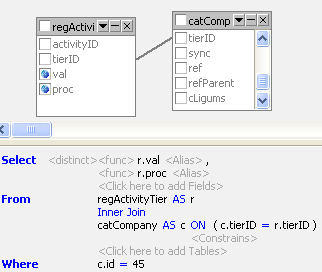 Synchronizing table structure as a change is assumed also auto_increment value. Hope this will fixed in future versions. Picture 7th Create a visual query.